Independence Day inspired fashion always makes me smile. Mainly because I’m already drawn to navy, stripes, stars, white jeans and chambray tops all summer long anyway. In honor of America’s birthday, we’ll be heading out to Long Island for a large family BBQ. I’m fairly sure that I’ll be wearing a similar version of last year’s July 4th outfit (white jeans~obsessed with this new cropped fit from J.Crew, navy top, star earrings and a fun coral necklace to add a dose of red to the mix). Then, this weekend we’ll be celebrating yet again, this time with fireworks and cocktails at a nearby country club. I plan on upping the style factor just a little, while still going with the same theme of course. I’ll be swapping my Havaianas for a slightly higher heel, going with white jeans that are just a bit more polished and donning my newest favorite, this navy sleeveless blouse from Lilly Pulitzer. While I won’t be wrapping the flag around my neck like this adorable image may suggest (although this scarf caused me to consider it for a minute…) I do like the idea of bringing along a cardigan or perhaps a really fun scarf (like this one) to ward off the air conditioned chill. What fun plans (and outfits!) do you have lined up for tomorrow? I love that scarf! 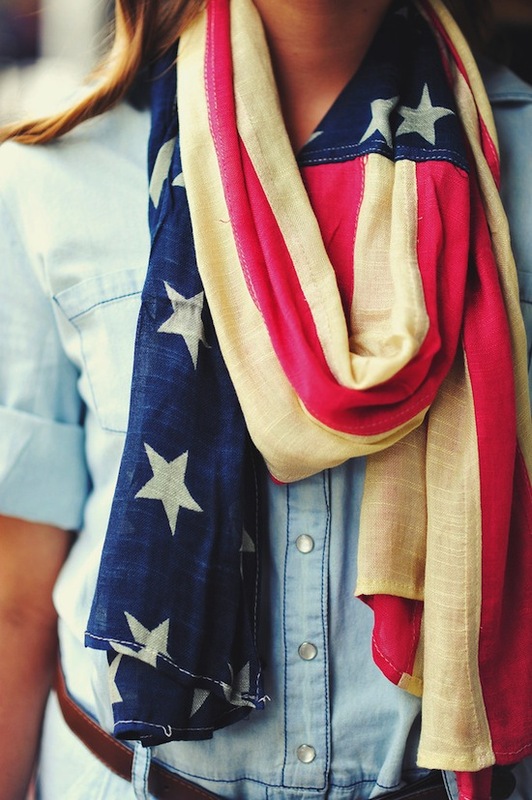 The 4th is my favorite and it is such a fun holiday to wear some fun and stylish outfits! Like you Sue, a big family and friends BBQ, with lots of food, fun and laughter! Hoping the weather cooperates for some outdoor entertaining and keeping our fingers crossed it doesn't rain! Wishing you a wonderful 4th. We'll be holding a BBQ! It's a really good thing the weather has been superb the past week and will continue to be for the next week. 🙂 Just in time for July 4th.